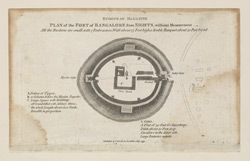 Engraving of a plan of the Fort of Bangalore from sights without measurement by Claude Martin published in London in 1792 after an earlier drawing also by Martin. In the late 18th century, the Muslim rulers Haidar Ali (r.1761-1782) and his son Tipu Sultan (r.1782-1799) fought numerous wars against the British over the control of Southern India. The fort at Bangalore was originally built out of mud by the founder of the city and Hindu ruler Kempe Gowda in the early 16th century and was reconstructed in stone by Haidar Ali in 1761. It was built in an unusual oval shape with eight gates, only one of which survives today. Bangalore fort was captured by Lord Cornwallis and his army on 21 March 1791.